What is Your Crutch Word – How Did You Get Rid of It? Craig from Ingles Podcast is “So” and has lots of examples of what to avoid. Mark from the Resourceful Designer and Podcast Branding had a listener let him know he was saying Basically a ton. Mel From Beer with an Engineer has lots of ums, and so…. but turned it into a drinking game. Mike Dell from Podcast Help Desk and Podcast Help Desk News crutch words is “Anyway….” and he's just been pausing instead. Kim Krajci from Toastmasters 101 has some tips on how to avoid crutch words. Try to figure out what is going on when you use it. Try to determine why you chose to use that word at that time. 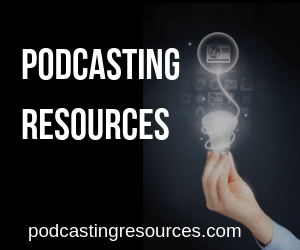 Are you paying for any part of your podcast process? If so how much, and on what? (not so much who you are using). Thank you Dave for making this the question of the month for March. Listening to my answer really tossed that proverbial nail on the coffin for me about how much I say “ya know?” I improved by going through this exercise, and I’m looking forward April’s question of the month.